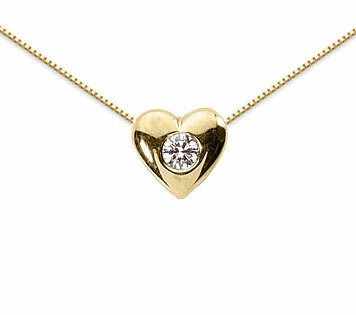 This petite diamond heart pendant will always be in good taste, making it an excellent emblem of your promise to love your special someone for the long haul. This polished heart holds a single round stone, adding sparkle and timeless class, and packing a lot of style this 10mm-high piece. The versatility of this pendant lies in its sophisticated simplicity, and its unfussy style allows it to complement a wide variety of looks, whether it's worn on its own or in tandem with other gold jewelry. We guarantee our 0.10 Carat Diamond Solitaire Heart Pendant, 14K Yellow Gold to be high quality, authentic jewelry, as described above.